Filip Mareš clinched the Colin McRae ERC Flat Out Trophy for his heroics in claiming his first victory in the FIA ERC Junior Under 27 category. 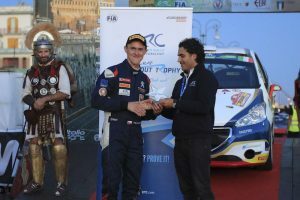 Mareš, part of the ERC Junior Experience training scheme, started the final leg of Rally Roma di Capitale in third place in class but a brave performance through the damp and mud-affected opening stage propelled him into a lead he wouldn’t relinquish. Driving for the ACCR Czech Team, Mareš moves to the top of the standings ahead of the final round in Latvia next month. He is pictured receiving the trophy from ERC Co-ordinator Jean-Baptiste Ley.